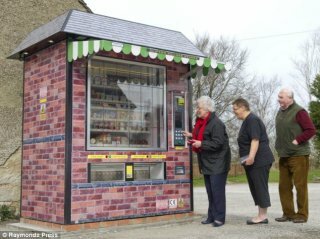 New Village Shop Vending Machine in Newton Flotman? Around 40 people gathered to worship at our Benefice Service this morning in Swainsthorpe Church. Julian Bryant from Christian Aid spoke on John 6:1-15. The collection totalled £175.70 all of which will go to help children in Kenya affected by HIV. This is a ‘matched giving’ scheme - for every £1 donated another £17 is added - this means the project will benefit by almost £3000. Thanks to all who gave so generously. The message of the cross is central to the Christian faith. As a symbol, the cross is universally known, and either revered, reviled or ignored. But how many people connect the cross with Easter? Reports suggest that these days very few could even explain what it means....could you? Here’s a quick summary: God created man and woman to enjoy friendship with him – but they chose to ignore God and go their own way. Because of this, evil has flourished and all mankind suffers as a result. But God, in his love, has not abandoned us and left us to it. He did something about it – by sending his own Son, Jesus – who lived a pure and unblemished life – to take the punishment we all deserve by dying in our place. No one else was qualified to do this – the payment for ultimate evil could only be made by ultimate good. And it gets even better....the Bible says that whoever comes to Jesus asking forgiveness will be forgiven and receive a new life that never ends. A life that begins now - and continues beyond death for all eternity. When Jesus rose from the dead on Easter Sunday, it was proof positive that all he’d said and promised was true. There are some excellent books that help explore the evidence for the resurrection – please get in touch if you’d like to know more. This website features details of our Easter services and events – we would love to welcome you, wherever you are on your journey of faith. God bless you this Easter and always! 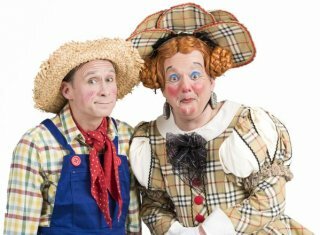 Some of the stars of this year’s Norwich Theatre Royal pantomime are throwing their weight behind a bid byNewton Flotman church to boost its coffers after being targeted by lead thieves. Ben Langley, who plays Silly Billy in Jack and the Beanstalk this Christmas, will be making a guest appearance at the festive fair at St Mary’s Church in Newton Flotman. The event runs from 10am-3pm on Saturday 3rd December with light lunches and cakes available. Ben will be arriving at 12 noon.. He will be exploring the stalls and meeting some of the parishoners who are helping to raise money for the church. Maybe he'll be in some of the Christmas photos - you can book a Christmas photo shoot for your child with Vicky for just £3. The photos make great Christmas presents and will be delivered in time for the Christmas post. The fair was initially going to boost the parish coffers to make the building more of a space for community events but now at least some money is going to have to be diverted to replace the lead following November’s theft and also increase security at the building. It is the second time the church has been targeted in recent months following an attempted lead theft back in May. Ben’s visit comes amid rehearsals for this year’s pantomime which opens on December 13 and runs through until January 15. He joins a star cast which includes world-renowned dancer, choreographer and performer Wayne Sleep, and the Theatre Royal’s panto stalwart Richard Gauntlett. Two friends went through university together but separated after graduation, eventually losing touch with each other. One of them went on to become a judge, the other took a very different path and ended up a criminal. One day the criminal was brought before the judge. He had committed a crime to which he pleaded guilty. The judge recognised his old friend and now faced a dilemma. He was a judge, so he had to be just, he couldn’t let the man off. Yet he didn’t want to punish him because their friendship had meant so much. So he told his friend that he would fine him the correct penalty for the offence. That is justice. Then he took off his wig and robe, came down from the bench and wrote a personal cheque for the amount of the fine. He gave it to his friend, saying he would pay the penalty for him. 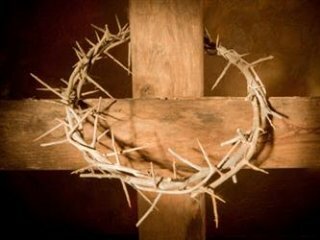 That is mercy.This story, used by Nicky Gumbel on the Alpha course, illustrates something of what Jesus did for us on the cross. The crucifixion brought both justice and mercy as Jesus paid the penalty for all our sin. In so doing he gave us a fresh start and opened the way to friendship with God. As we celebrate not only his death but his resurrection this Easter, why not renew your faith at one of our services – or perhaps come along for the first time and discover the good news of God’s love, forgiveness and freedom – the gift he offers to all who recognise their need of it. Newton Flotman & Tasburgh’s village shops closed a while ago, and anyone wanting to buy the basics such as milk, bread, toilet rolls etc. has to trek to Mulbarton, Long Stratton or the outskirts of Norwich. That’s not always easy or convenient. To find out if a new type of village shop vending machine, open 7am-7pm and selling essential fresh foods and groceries, would be of benefit to the village, the PCC is undertaking a survey. The survey, and a stand explaining how the church tower could be adapted to improve its use for the community, will take place at Newton Flotman’s Village Fete on Sunday 7th September. The survey will also be sent to every household in Newton Flotman & Swainsthorpe via the parish magazine Partnership, and is also available online at https://www.surveymonkey.com/s/BWSX9JL. Please do take part and let us know what you think. Thanks! At the time of writing, we've enjoyed over two weeks of intense summer sunshine here in Saxlingham Nethergate. Booootiful!! Eratosthenes, an Egyptian librarian who lived around 2,200 years ago heard that the sun could be seen shining at the bottom of a well in the town of Syene on the longest day of the year. He surmised that to make a reflection in a well, the sun had to be directly overhead on that day. And a sun directly overhead would cast no shadows from upright columns or posts. Yet on the longest day of the year in the city of Alexandria, where he lived, he observed that straight columns did cast shadows. He decided to travel to Syene himself to verify that what he had heard was true. At midday on the longest day of the year, he looked into the well and saw the sun reflected. And sure enough, the posts in Syene cast no shadows. He reflected on that. After a while, he began to see a bigger picture of what these seemingly unconnected facts meant. Surprisingly, it went against what nearly everyone believed at the time. In the third century BC, nearly every scholar believed that the earth was flat. But Eratosthenes reasoned that if the sun’s light came down straight and the earth was flat, then there would be no shadows in both Alexandria and Syene. If there were shadows in one location but not the other, then there could be only one logical explanation. The surface of the earth must be curved. In other words, the world must be a sphere. That’s a pretty impressive mental leap, although it seems perfectly logical to us today. After all, we’ve seen pictures of our planet from space. But Eratosthenes made that ‘big-picture’ discovery. How well do you see the ‘big picture’? A world map published by the National Geographic Society has this notation: “Earth’s mass is 6.6 sextillion tons.” And what supports all that weight? Nothing! The planet we inhabit spins on its axis at 1,000 miles per hour as it hurtles through space in its orbit around the sun. The Old Testament character Job repeatedly thought about this ‘big picture’ stuff. “God stretches out the north over empty space. He hangs the earth on nothing!” Job said in chapter 27 of his book. Job marvelled at the clouds that didn’t break under the weight of the heavy water inside them and the horizon “at the boundary of light and darkness”, but called them “the mere edges of God’s ways”. For Job, the heavens and the earth pointed him to God the Creator. This goes against what many believe today - but I'm with Job. It thrills me to know that the same God who created and upholds the universe by the “word of His power” (Hebrews 1:3) is with us in our everyday lives. I want to tell you about a particularly spectacular rainbow that I saw when driving down in Hampshire some years ago. It was huge and it was close and I will never forget it. It was over and in the field alongside the M3 where I was driving. The wonderful thing was that I could see both ends of the arc and the colours were so vivid against the dark menacing sky. I just stared in awe (whilst trying to keep my eyes on the road ahead!). At the same time, dozens of other vehicles were zooming along the motorway in both directions and I wondered how many people in those vehicles noticed the beautiful rainbow and how many were oblivious to the marvellous sight just a few hundred feet away from them. I don’t know about you, but it’s easy to succumb to ‘tunnel vision’ when driving isn’t it. It’s like that in life too. We can become so engrossed in our own lives, our own problems perhaps, our own desires and thoughts; and be so busy barrelling along at top speed that we miss the glory of God’s loving presence beside us. The Psalmist reminds us that the rainbow of God’s presence surrounds us constantly. So today, as each of us travels along our own highway of life, going about our daily chores, routines, jobs and whatever, let’s try not only to be conscious of our own personal world but also of the created world which declares the glory of God and the splendour of His everlasting presence with us. Let’s not miss the rainbow! "When you see a rainbow in the sky, have you ever stopped to wonder why? Is it there to decorate the sky? What does it mean? That as long as time shall last, He will care for you." Work is about to begin on reglazing and repairing the west window at Tharston Church. The window is glazed with Victorian glass using painted and stained quarries with a decorative border all round. Because the lead which supports the glass has lifted, it allows water to seep through the window leaking across the cill and into the vestry during heavy rain, such as that we experienced last autumn and winter. Clearly water ingress to any building is not good and the PCC have decided to undertake a programme of repair. The cost to the Church will be in excess of £2 500; this is in addition to the normal daily running costs of Tharston church of about £8 000 per annum. If any parishioner would like to send a donation, however small, towards this work to help to keep your Parish Church in good repair to pass on to future generations, it would be very gratefully appreciated. Please send whatever you can to the PCC church treasurer, Chris Lawson, Holbrook, The Street, Tharston. To celebrate the completed conservation work at St Martins and to acknowledge midsummer, an early evening picnic with musical entertainment will take place from 6.30 p.m. at St Martin’s. Please bring your own picnic, as the SVA will provide just the music (and shelter if inclement weather threatens). By popular demand, the fete this year will again be on the playing fields from 2 p.m. There will be games, events and the tug of war should be back. In the evening there will be music, dancing, a hog roast and a bar from 7.30 until 11 p.m.
By kind permission of Ed Howard at Hill Farm. Following the outstanding success of this event last year there will be another chance to sup champagne, celebrate harvest and twirl your partners. Start 7.30 p.m.
Trinity Hall 7p.m. Listen to the clues and work out the telling questions to ask. Can you identify the murderer? Can you work out the motives? A supper and brainteaser to test your powers of deduction. The Norfolk Village Games: heats 9th June at Framingham Earl High School and County Finals 14th July at UEA Sportspark. Actually, you may feel that the word ‘hope’ doesn’t say very much – it doesn’t sound very certain. We might say, “I hope everything works out for you” or “I hope the weather stays fine” but there’s little or no confidence that things will ‘work out’ or that the weather will ‘be fine’. Its fingers crossed time! If you’re in the habit of buying a lottery ticket, you hope to win I’m sure. The odds of winning the EuroMillions Lottery jackpot are 1 in 76,275,360 – a fairly faint hope I think you’ll agree. And what about feelings of hopelessness? They are extremely powerful, bringing down even the sturdiest of individuals, and can lead to severe depression and sometimes even thoughts of suicide. Everyone needs hope and love. Alexander Pope once said, “Hope springs eternal in the human breast” It is my belief that our society needs a hope revolution! Of course, whatever we are placing our hope in, in this life, will eventually be gone. But here’s a true saying and one to ponder…. “If you have been reduced to God being your only hope, you are in a good place.” My teenage friend had found that place. She'd discovered that in Jesus real hope is found. Why? And how can she be so sure? Because everything God promises He does. The Bible is jam-packed full of God’s wonderful promises (around 3,000 of them!) Yes, everyone needs love and hope; and in God both are abundantly found. Over the Easter period we are reminded that Jesus was amazingly raised to life again to bring us real hope – to bring you real hope. Have you discovered it? Upside down is fun! Stanley, our youngest grandson, is just 2yrs old and absolutely loves to be held upside down. We were playing together recently and he kept calling out “Again!” “Again!” as I turned him over and over. There are a lot of things that intrigue me about Jesus. One of the aspects of His ministry that has always produced jaw dropping, head scratching responses is His upside-down teaching about life. On our journey through life our thought patterns and responses to life’s events can become deeply engrained. But Jesus interrupts us in the midst of our routines and calls us to a new and better way. But beware! This encounter with the ways of Jesus is challenging. Here are some of Jesus’ paradoxical propositions… “To live you must die.” "Blessed are those who mourn.” “To rule you must serve.” and “Suffering has purpose.” It is statements like these that make some people think that Jesus is strangely out of touch, but nothing could be further from the truth. We were thrilled with the response to this year's Samaritan's Purse Shoebox Appeal. 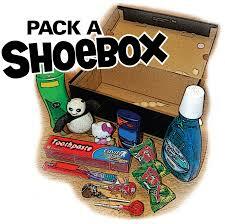 We gathered 250 shoeboxes to send to children who otherwise would receive no Christmas presents this year. Thanks to all who gave so generously of their time, money and effort to make this possible. Have you taken any special photos of British wildlife? From otters to orchids, from bluebells to butterflies, all entries into our special exhibition at the church for Open Churches Week, 6th-14th August, are most welcome! Please print them out between 5`x7` and A4 for display purposes. Categories are: Under 16 and Adults. Many thanks for your support at the Fete. Big thank you to all of you who brought along cakes, bottles, books, plants, prizes etc. It was a great day and our thanks to the Rt. Hon. Richard Bacon MP and his wife Victoria and their children for spending so much time with us. Tony Talby is still counting the money and as soon as we have a final figure we will let you know. Finally a big thank you to Tracy, her sub-committee and the Project Ideas Group (PIGs) for providing us all with another fantastic village event. You can view some photos by clicking here.